Yakihata Turnips – Yamagata University » Tsuruoka, Japan a Creative City of Gastronomy To Become a "Utopia of Food"
Tsuruoka, Japan a Creative City of Gastronomy To Become a "Utopia of Food"
Tsuruoka is one of the cities in Japan where regional food culture remains strong. Burnt farming is known as yakihata (literally, “burning down the field”) agriculture in Japanese.Turnips grown through yakihata are called yakihata turnips.The Yakihata turnip is well known as one of the “indigenous crops” that have been carefully preserved by farmers since the Edo Period (1603-1868) in limited areas around Tsuruoka city; and there are various kinds of yakihata turnips by region. We visited the forest owned by the Field Science Center in the Faculty of Agriculture at Yamagata University. 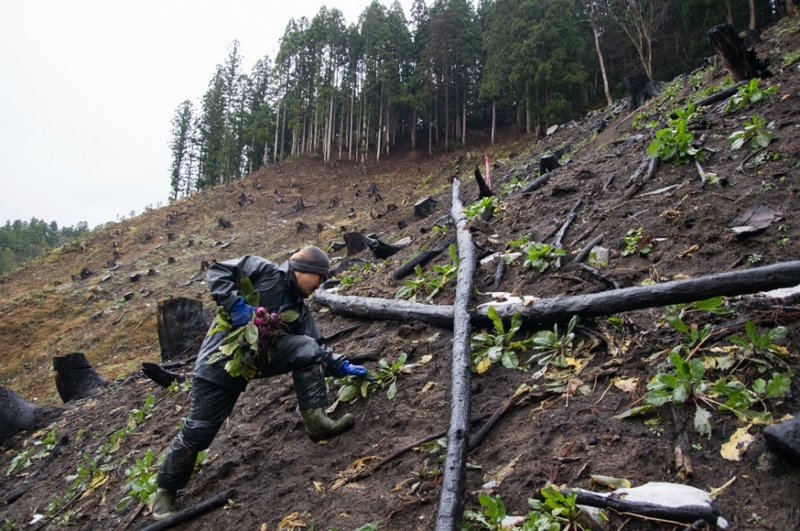 The university has attempting to deal with yakihata agriculture from new angles and has been engaged in it for 11 years in the university’s forest located in Kami-nagawa, in former Asahi-village, which is used as research field for students learning about forests and the forest industry in general. We interviewed some of the staff members to learn how they have kept their motivation for the yakihata agriculture to date. Traditional yakihata agriculture is closely related to the forest industry, and there is an academic course to learn forestry in the Faculty of Agriculture at Yamagata University. Although the University forest is mainly used for research related to forestry, yakihata turnips are also produced as a by-product of the field. Mr. Daisuke Arai, technical personnel of the Yamagata University Forest, showed us the basic processes of the yakihata agriculture. Yakihata plays an important role in site preparation for planting cedars. It is said to help in reducing the mowing workload, especially when the trees are still young, because the burnt field can inhibit the growth of weeds. Mr. Arai says yakihata was especially successful this year. It is said that the result of agriculture is influenced a lot by weather conditions. So, farmers keep an eye on weather forecasts to decide when to burn the field by considering how cedar branches can dry. Mr. Arai seems to be happy with the timing the fire this year (on August 6th), which was more or less as he intended. 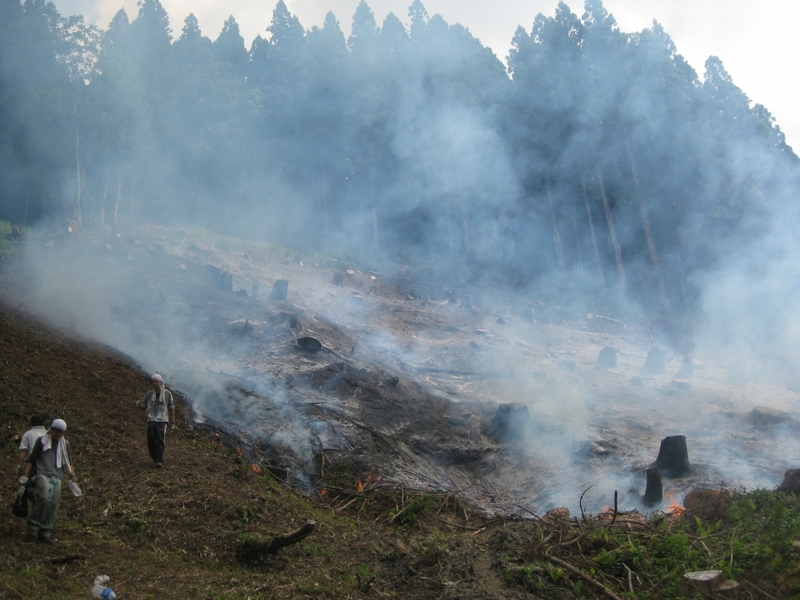 This year, the area of yakihata was 0.2 ha on a slope of 30 degrees with 102 year-old cedars artificially planted. The forest was cut in mid-March and about 200? of cedars were brought out of the site. 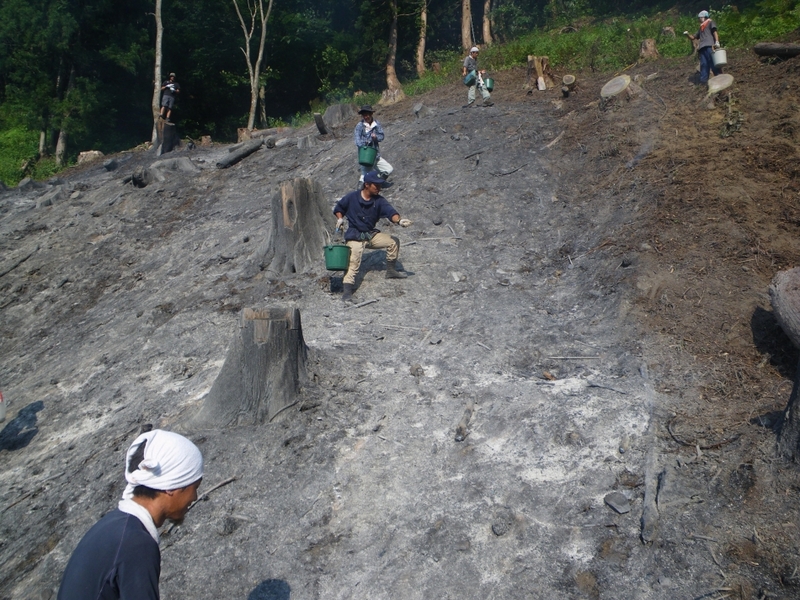 Before burning off the field, they take special care to reserve enough time to dry the cedar branches after cutting. 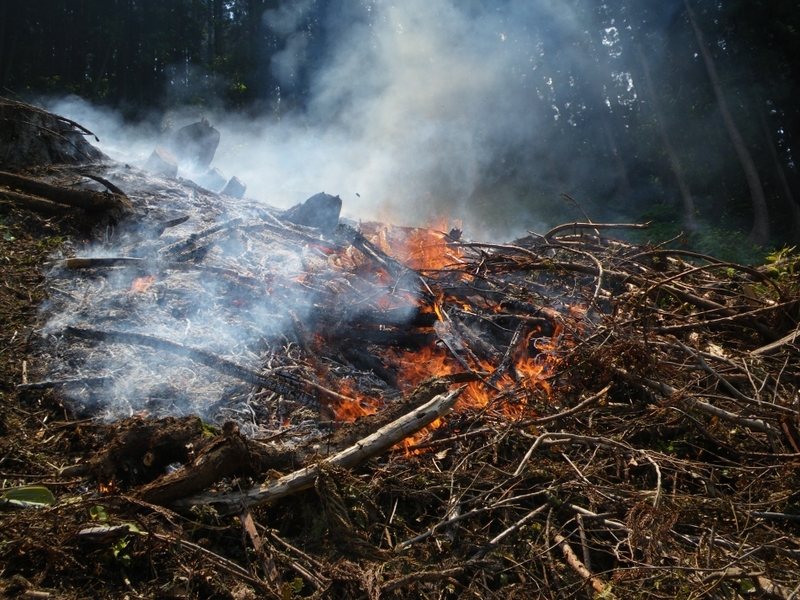 Mr. Arai says that deciding the date of burning is a point that is both fun and difficult, considering the whole schedule, because cedar branches may not sufficiently dry due to the morning dews before mid-August. Incidentally, the yield was 560 kg this year. In the past, however, the yield reached as much as 1 ton in the most fruitful year, although the produce is not normally stable. Although We Are Not Professional Yakihata Farmers, There Is a Lot We Can Do as Quasi-farmers. It seems Yamagata University is thinking that participating in producing yakihata turnips will serve as an opportunity for their students, many of whom are from outside of Yamagata Prefecture, to understand the features of this area. Although the yield and economic benefits may be less than those of the professionals, the meaning of continuous production of yakihata turnips is not small because the university aims to run a forest not just for their research but also to be close to the local community. 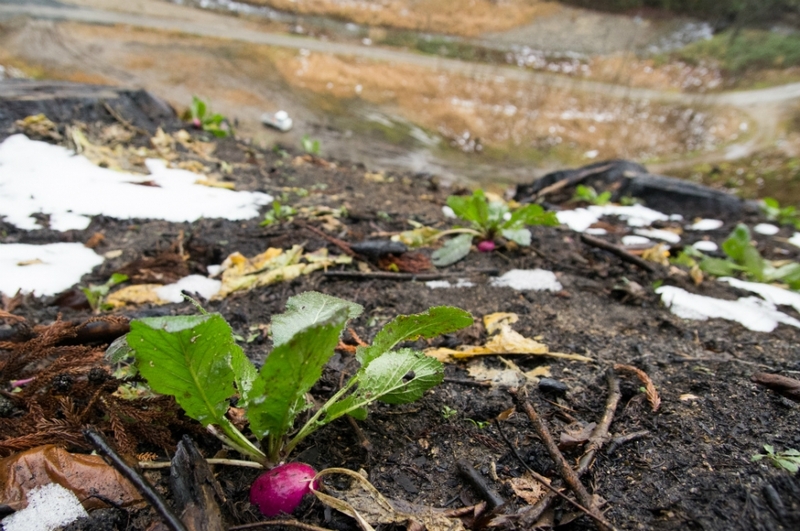 It is also important that turnip seeds do not mix with other kinds of seeds because the university forest is located in the area remote from the city. It is difficult to protect pure turnip seeds from those of other Brassicaceae families, like cabbage, if they are close each other because they are easily crossbred. This may be useful from the points of view of both gene conservation and their research. 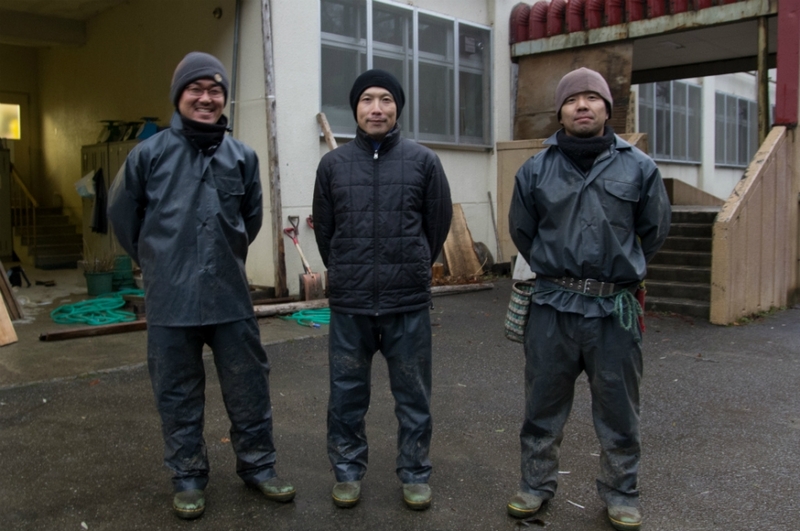 We asked Mr. Arai how we can obtain yakihata turnips produced in the university field. They hold an agricultural market every Thursday on the premises of the Faculty of Agriculture, Yamagata University (Wakaba-machi, Tsuruoka City) from spring (around April) to autumn (around November), and yakihata turnips are available in the markets from October when the harvest starts. The vegetable can be delivered upon request. Residents around the university often purchase yakihata turnips grown in the university field, and some of them make pickles from the turnips and bring them to the university, says Mr. Arai. This is how they expand their relationships through foods characteristic to the region. From five years ago, when the yield of yakihata turnips from the university field became stable, they also have transacted with a long-established Japanese pickles shop “Honcho”. Through a process of trial and error, they have worked on yakihata with assistance from inside and outside of the region. “Not just producing lumber in the mountain, we would also like to consider ways to find multiple uses of the forest within a cycle of forestry and farming,” says Mr. Arai. Mr. Arai referred to the university as a quasi-producer in the yakihata turnip production industry. We have learned that there is more than one way to take over traditional agricultural methods and to preserve indigenous crops. The time may soon require a variety of people with various points of view to be involved in this agriculture, where some purely produce the crops and others focus on public interests or their research activities.